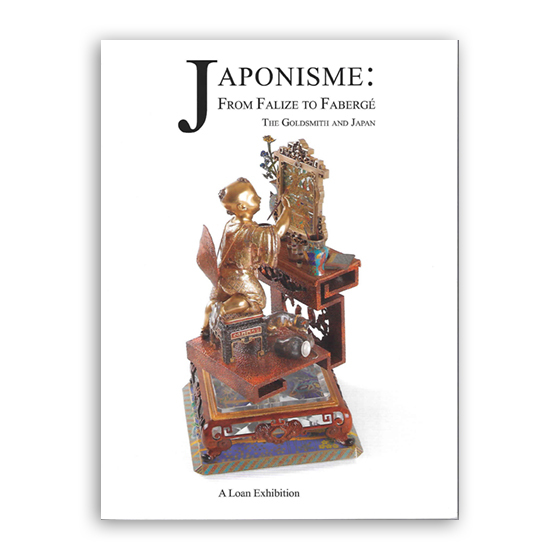 This exhibition, spanning the fifty years from 1867 to 1917, was the first devoted to the influence of Japanese works of art on Western jewellers and goldsmiths including Falize, Boucheron, Fouquet, Gaillard, Vever, Lalique, Cartier, Tiffany, Gorham, Elkington, Wolfers, and Fabergé. Some 160 jewels, objects and original designs assembled from public and private collections were shown alongside photographs of related Japanese source material. Amongst the loans were a centrepiece by Boucheron featuring a Japanese boy painting a screen, an early diamond-set corsage ornament by Lalique composed of a spray of cherry blossom (measuring 29 cm), a brooch in the form of a chrysanthemum set with Mississippi pearls by Tiffany, a biscuit barrel designed by Christopher Dresser decorated with Japanese mon and a hardstone Japanese flower study poised on a miniature table by Fabergé.